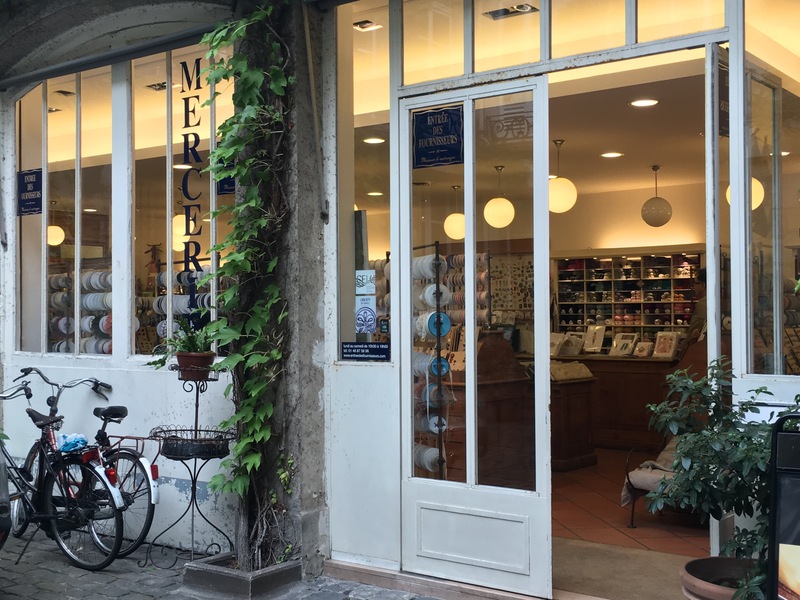 Walking through Le Marais, in the heart of Paris, along narrow, cobbled streets I feel as if I am stepping back in time. The roads are about a carriage width across. Pavements are ribbon thin and allow just one person at a time to proceed. I’m staying in a former warehouse now converted into a stylish and relaxed boutique hotel. It’s called the Jules et Jim, in recognition of Francois Truffeau, a famous film director of the 1960s and 70s. 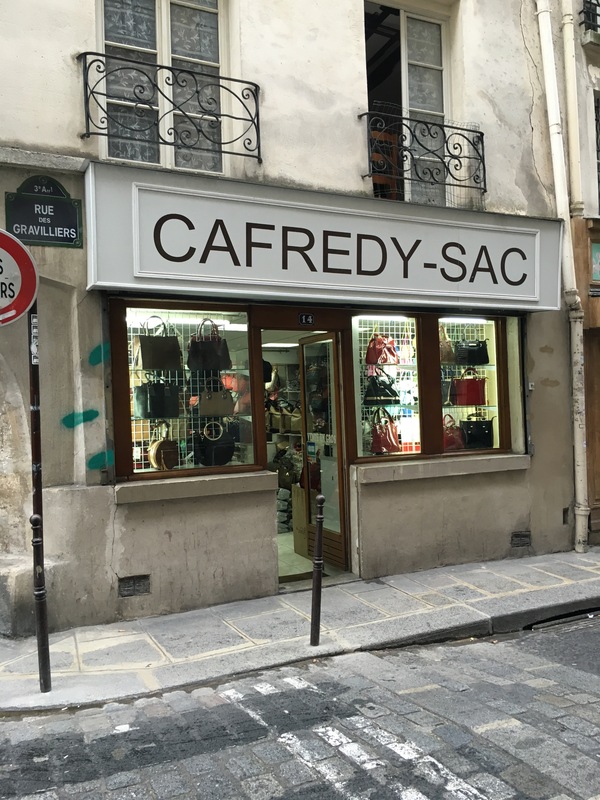 On the Rue Gravilliers, where my hotel is located, there are numerous shops selling handbags, all shapes and sizes of bags, all colours too. I count at least ten separate shops as I walk west towards Beaubourg. 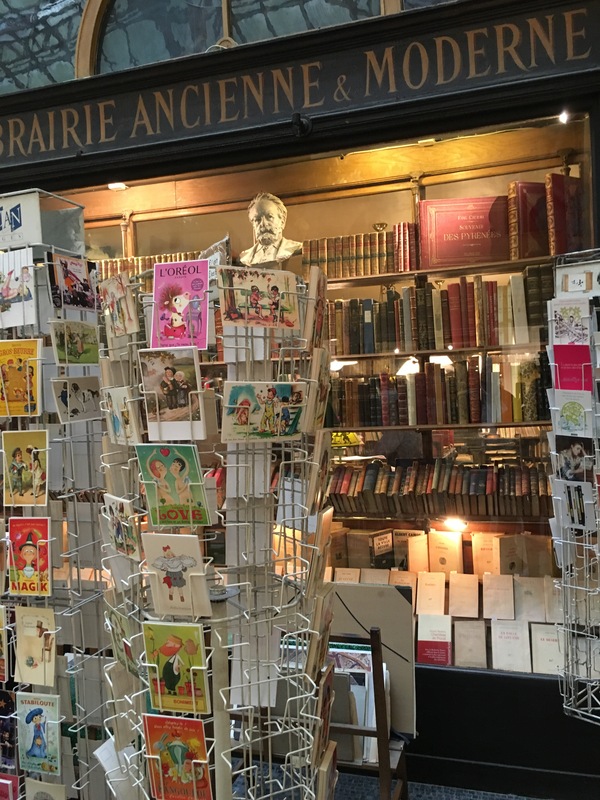 I marvel at the concentration of certain trades in specific parts of Paris. It gives the city and each of its neighbourhoods a unique and distinct atmosphere. We’ve lost this clustering of trades in London. I turn right onto Rue Beaubourg. Immediately in front of me is the spectacular Pompidou Centre, a monolithic rectangle of glass and steel. A collaboration between architects Rogers and Piano. The gas, electricity, water and heating supplies to the building are all on the outside, giving a huge uninterrupted space internally for art exhibitions and diverse events. It has become a major Parisian landmark and can be seen dominating the skyline of this neighbourhood just north of the Seine. Today I’m heading in the opposite direction. I’ve given myself a mission. 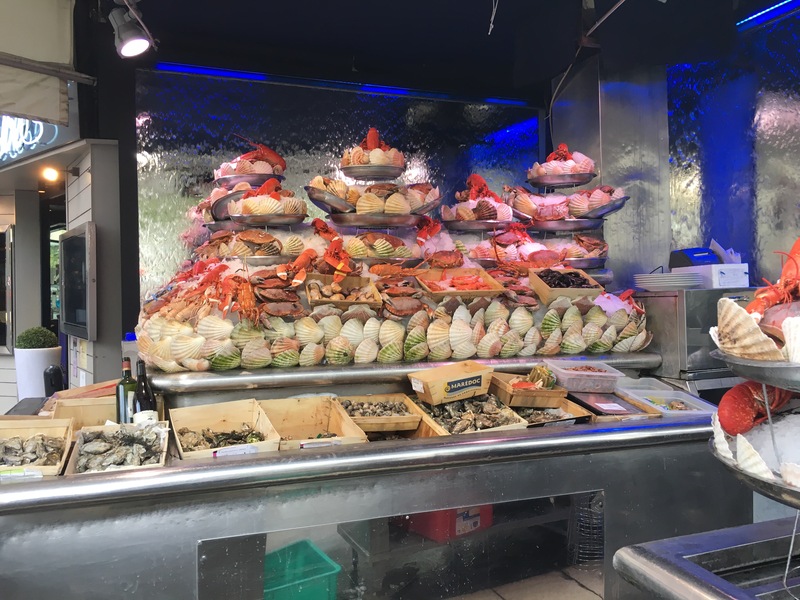 It is my intention to walk to the Sacre Coeur using small roads and the ubiquitous ‘passages’ that offer pedestrians a covered walkway, lined with shops from one side of a city block to another. 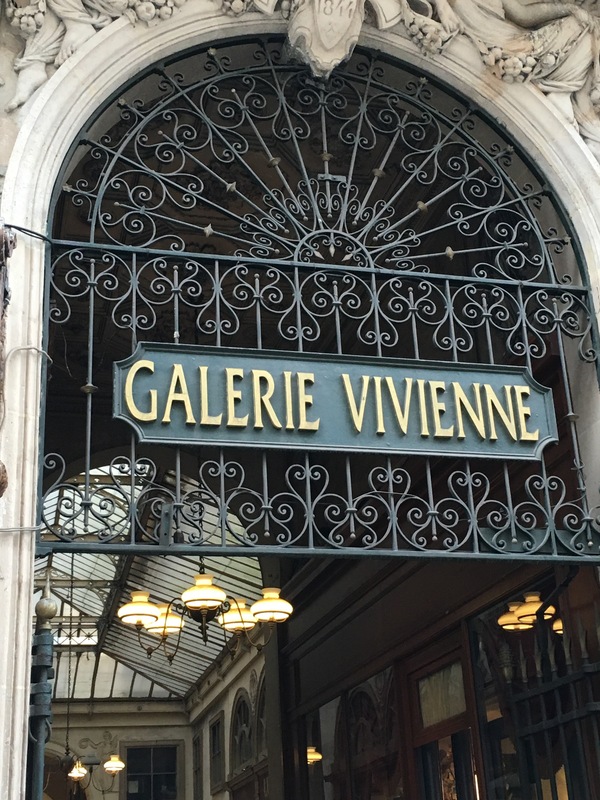 These ‘passages’ and their more upmarket cousins ‘galleries’ are found throughout Central Paris. At the top end Galeries Vivienne is a magnificent, mosaic floored, belle epoque arcade lined with unique designer shops and smart cafes. This morning I walk through a much more modest ‘passage’ lined with rather scruffy looking barbers shops, offices selling translation services and kiosks offering cheap money transfers worldwide. There’s a couple of shabby clothes stalls selling t-shirts, baseball caps and football shirts. I have to confess that my pace quickened slightly as I walked through this desolate and rather miserable ‘passage’. I finally emerged into bright sunshine on the Rue Magenta. 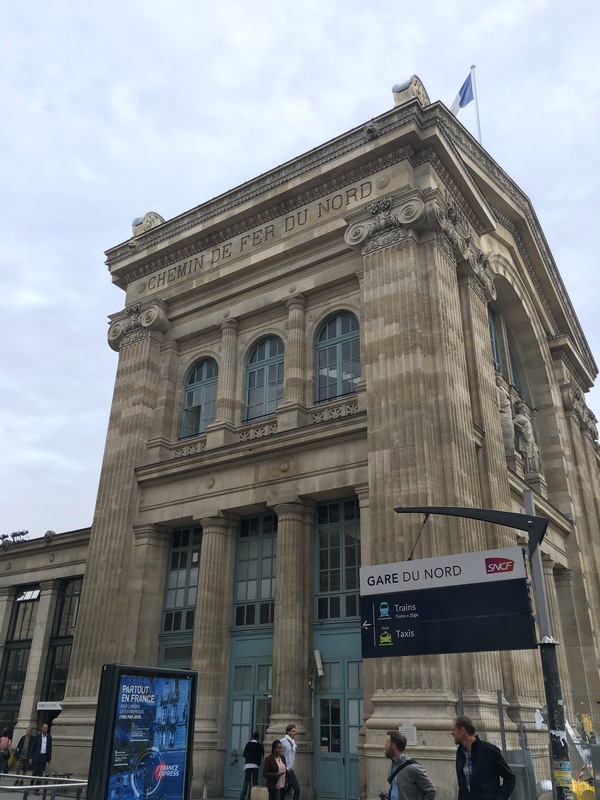 Round the corner is the Gare du Nord – this is the main train station for all routes north. For many years it was the only way to get to Calais relatively quickly. From there travellers would board a ferry to cross the English Channel (or La Manche as the French insist on calling it) to England. It’s still one of the biggest train stations in Paris. Trains leave here for Lille, Brussels, London, Antwerp, Rotterdam and Amsterdam. I’m reminded of a charming story about an elderly French gentleman who had always wanted to visit England. It was about 1880, the gentleman instructed his servants to prepare the carriage and horses. He and his entourage left his home near the Bois de Boulogne in south-west Paris and proceeded to the Gare du Nord. When they arrived they were too early for the train north, so they retired to a tavern run by an enterprising English woman. The gentleman enjoyed British beer, Steak and Kidney Pudding and Treacle Tart with custard. He watched the bar maids and his fellow travellers chatting in English – all waiting for the train to the coast. He enjoyed several more pints of beer and began to feel a little tired. He suddenly decided that he’d seen enough of ‘England’ and English life even though he’d never actually left French soil. He instructed his servants to ready the carriage, and he returned home. I love this story because it demonstrates so clearly to me that the notion of travel and the idea of the journey are often much more interesting than the destination or one’s perception of the destination. 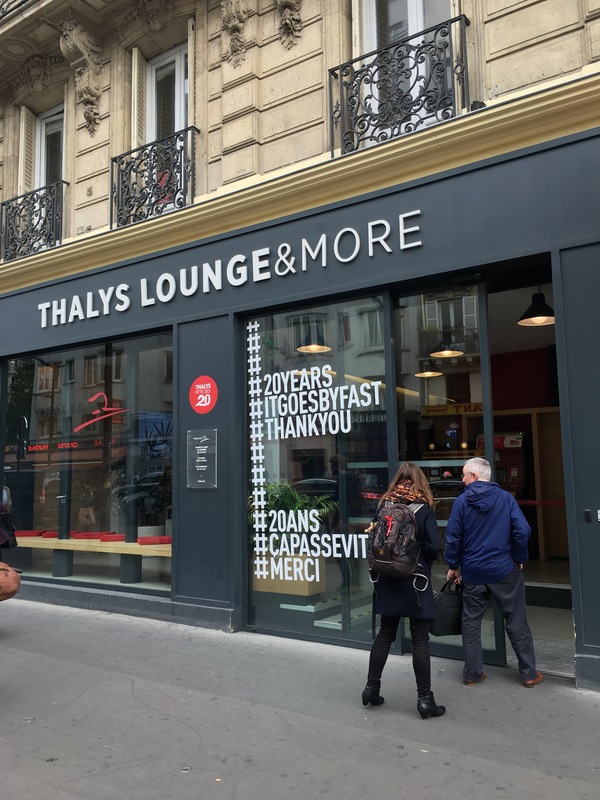 So this gentleman wanted to go to England, he got to Gare du Nord, enjoyed the delights of an ‘English Tavern’ and that was enough for him. He then went home. I wonder if the gentleman ever regretted his decision? Cafes line the pavement at Gare du Nord, advertising burgers, chips and the latest football match on the telly. I trot on past the smart Eurostar platforms that whisk travellers from Paris to London non-stop in just over two hours. It used to take at least eight hours to make this journey from Paris to London via train, ferry and then another train. 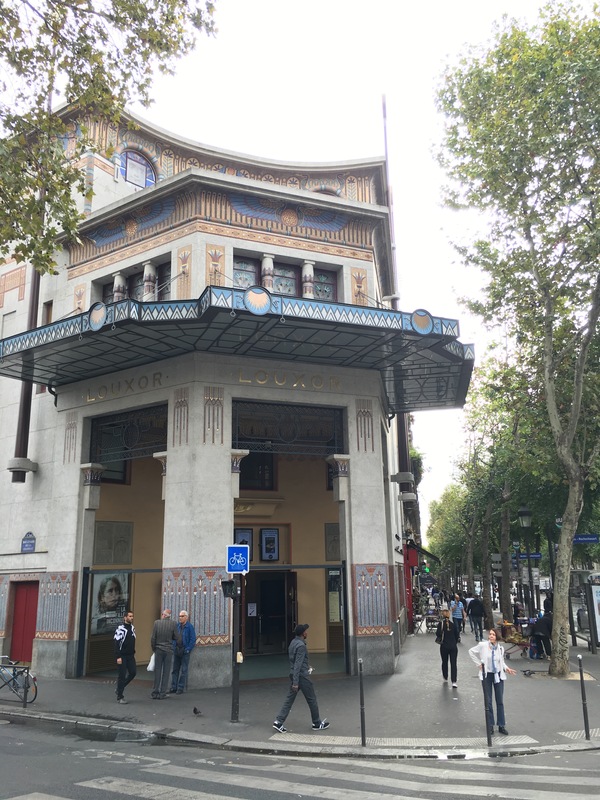 From here I continue along the Boulevard Rochechouart, I pass an incredible art deco style cinema, it’s called Le Louxor, The Luxer in english. It’s a flamboyant ‘Egyptian style’ art deco cinema. A remnant of France’s colonial interest in Egypt. Luxor is a city on the River Nile, they have amazing archaeological ruins – temples, columns, spectacular public areas. Thousands of years before now the Egyptian pharaoh a ruled the fertile lands of the Nile Valley. In the 19th century the British and French had various military scuffles over Egypt. From here it’s just a short walk through the small streets that climb up to Montmartre and the Church of the Sacre Coeur. 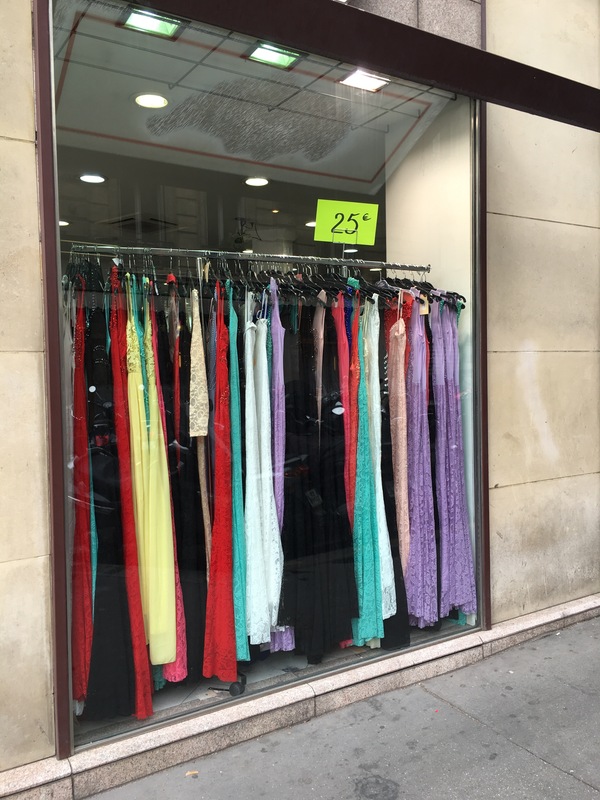 This is the garment district of Paris, I love it, shop after shop selling material, trimmings, ribbons, buttons, tassles………it’s all here. I love the feeling of being in a big city, surrounded by people going about their daily business. I meander through the many haberdashery shops, looking at fabrics, lace, felts, velvets. These shops employ numerous assistants. They’ve probably worked here for years. I wonder what their story is, where do they live? What matters to them? Round the corner I catch a glimpse of the white marble of the Sacre Coeur, a church built at the end of the 19th century to give thanks for France’s defeat over the Prussian Army. War and hostility is never far away. 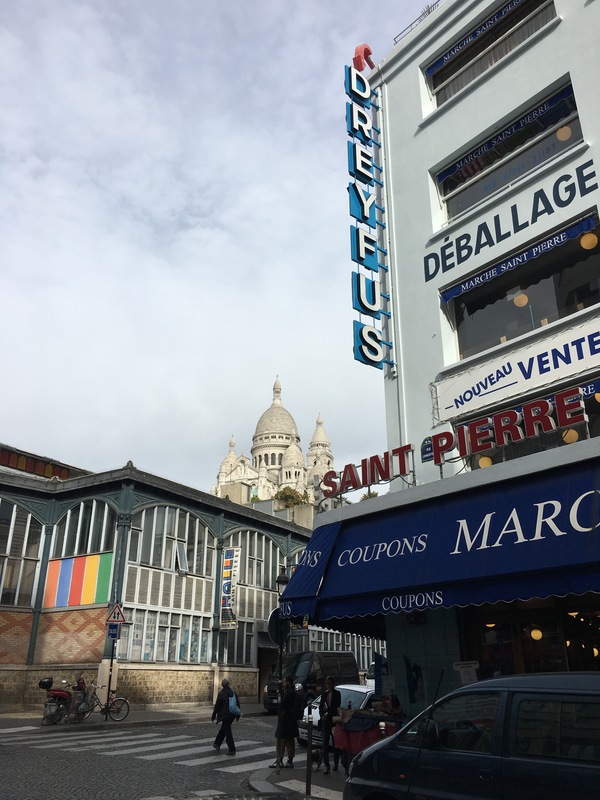 I love this last photo, the juxtaposition of the Sacre Coeur with one of the ‘sewing emporium’s’ of the area. 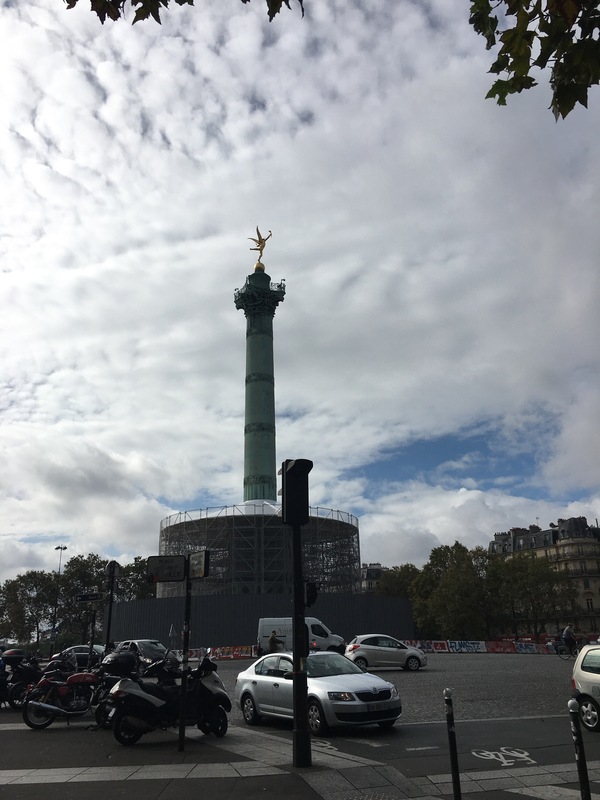 There’s everything here in Paris, old, new, grand. modest. So much to see and so much to discover. Thank you for taking us with you in your stroll through Paris. I should say Merci! Another terrific post, Janet! 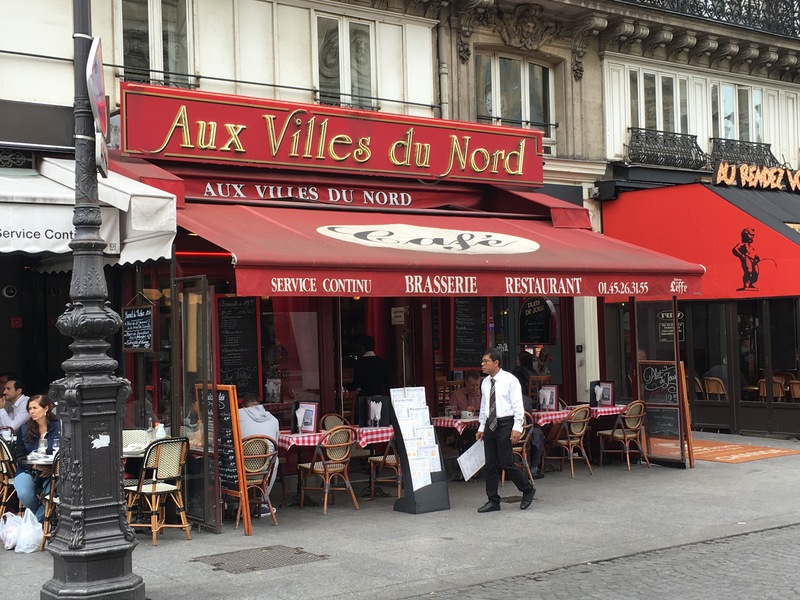 I have often thought how fun it would be to rent an apartment in the Marais district of Paris – for a month! Maybe between Air BnB and your knowledge of the neighborhoods I’ll zero in on a few streets… I can dream, can’t I? ?